Formed in 1995 when students at the Music University in Bucharest, Romania, the ConTempo String Quartet has toured the world extensively and have won a record of 14 international prizes. 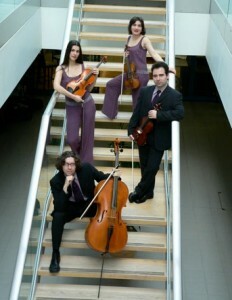 Since 2003, they have been Quartet in Residence in Galway. A Quartet of exceptional talent, they have toured the world giving more than 1000 concerts in places like Carnegie Hall, Wigmore Hall and Castel Gandolfo, the Pope’s summer residence. County Down-born Deirdre McKay studied music at Queen’s University, Belfast, and at the University of Manchester, completing a doctorate in composition at Queen’s in 2003. Former Composer in Association to the Northern Sinfonia’s affiliated Young Sinfonia, commissions include works for the Irish Chamber Orchestra, the National Chamber Choir of Ireland, RTÉ Living Music Festival, Sligo New Music Festival and the Naughton Gallery Belfast, with artist Jean Duncan. Her work has featured at the Park Lane Group Series at the South Bank, Orléans Concours International, The Phillips Collection, Washington D.C., New Muziekgebouw, Amsterdam and International Association of Music Information Centres’ Conference and New Music, New Ireland concerts, New York. Recent performances have included an Irish tour of her Louth Contemporary Music Society commission for the State Choir of Latvija, Plunkett’s last words, a Music Network tour of her second string quartet given by the Geneva-based Terpsycordes Quartet.